Diamond Platinumz' father, Abdul Naseeb, wants his famous son to marry a second wife. This comes after news of "Salome" video vixen, Hamisa Mobeto, confirmed that her new-born baby was fathered by the Bongo Flava star. The revelation has kept Diamond trending in Tanzanian showbiz circles. 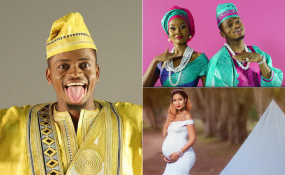 It's been long speculated that Diamond cheated on his partner Zari Hassan, by impregnating Hamisa during the shooting period of the "Salome" video. The musician has since vehemently denied these allegations, stating that he has never laid hands on the gorgeous Hamisa Mobeto. He even challenged the model to come clean and state who the real father of the then unborn child was during a radio interview. Diamond went on to add that it has become normal for ladies to use his name for cheap publicity. As things have turn out to be, however, Diamond (born Naseeb Abdul) could very well be responsible. After giving birth to the boy last week, Hamisa kept referring to the baby as 'Baby D' on her Instagram posts, leading many to speculate that it meant 'Baby Diamond'. A few days ago, Hamisa shocked the world by announcing her newborn son's name as Abdul Naseeb; Diamonds' father's official name. Despite Diamond continuing to lay low on the issue, his mother Sandra visited Hamisa in hospital last week, a few hours after giving birth. In a recent interview with a local TV Station in Tanzania, Diamonds' father Abdul, said he was elated with the news of having one of his grandchildren named after him. He urged his son to marry the lady officially because according to Muslim teachings, he is allowed to marry up to four wives. "Me naamini Abdul hajafanya kosa, yule dini yake inamruhusu kufanya kitu kama ile sababu ni mwislamu. Sioni tatizo, kikubwa tu ni awape vipato wote, matarajio yao wanayohitaji na kila mtu anaelewa yule mtu ana uwezo"